If you have any questions or want to enquire about dates, use our form to contact Mas Smyth & Richard Cunningham or see their website for more information. This forgotten corner of Scotland is blissfully empty – red squirrels, buzzards, kites and otters are its reclusive residents. Among the hills and forests is a farm run by Richard and Mas; going one step further than organic they practice bio-dynamic farming: their 450 acres flourish naturally, there are orchids, mushrooms, and ancient woodland providing pasture for their cattle and sheep. You stay in a carefully revived 100-year-old cottage: floors are locally-sourced oak, the kitchen uses recycled slate, the insulation is sheep’s wool. And an adjoining stable is a beamed sun lounge with doors to the large grassy garden. Drink in the views from the open porch while swallows flit in and out of the eaves. Both carpeted bedrooms are cosy and comfy with stunning vistas, one is en suite. You get two living rooms with plenty of lounging space and a wood-burner with a basket of logs. There are basics in the kitchen, bikes to borrow, a well-stocked bookcase, local art on the walls. It is almost eerily peaceful here – people come to write and read, or to bike and sail. Balm for the soul. Two extra bed settees available at no extra cost. 3rd visit to this fantastic cottage in a beautiful setting. Longshot is very well equipped, comfortable and unique. 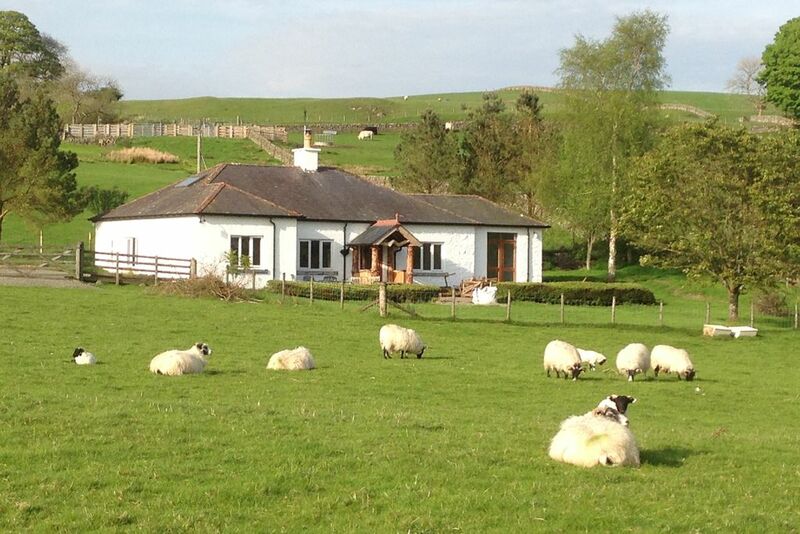 One of the best holiday cottages my family have ever stayed in. The number of repeat visitors shows we are not alone in loving this place. Thank you Mas and Richard. We will be back soon! Amazing sunsets from the cottage - long, long views towards the hills and mountains. And well done in getting here - it's not called the "Hidden Road" for nothing! Galloway Activity Centre, on the shores of Loch Ken, has a cheerful cafe; and you can go kayaking, sailing, climbing, mountain biking, wind-surfing, archery as well as have your cake and eat it! Check out Kitty's tea room in New Galloway if you want an old fashioned scrumptious treat; tiered plates overflowing with fancy bakes, and cake-names to make you giggle. We love going down to the Solway coast, where the sunlight glistens on the mudflats, and the seabirds cry hauntingly like you half remember from your youth. Have a pub supper while you watch the tide come in. The castles got ruined hundreds of years ago - there are dozens to explore, and lots of mysteries. Cairnholy is exceptional - standing stones in secret alignments, what do they mean?For good reason, this region is designated a UNESCO Biosphere.